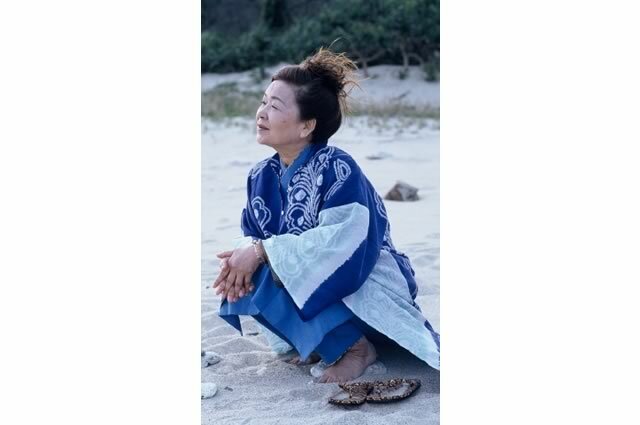 Ikue Asazaki (born 11 November 1935) is an Utasha artist, who is known for her performance in the traditional Amami Shimauta (folk song). She was born in Kedomi, Kakeroma Island, Amami Islands. Her father Tatsujo, influenced her early music strongly during her upbringing. she further developed her innate musical talent and was acclaimed as a genius singer in her early teens. Ikue has performed concerts around the world in such places as New York, Los Angeles, and Cuba. She has also performed extensively in Japan, including a series of concerts for 10 years at the National Theater of Japan. In 1997, Ikue released her debut mini album, “Amami” , featuring with piano performance. The album made a strong impression and has drawn significant attention from many famous artists, including Haruomi Hosono and UA. She has worked with a wide range of artists, including Ryuichi Sakamoto, Hiromitsu Agatsuma and UA. She performs with various musical instruments around the world while she maintains the traditional style in her singing. She is well known for her ethereal, earthy vocals. Slightly deep, obviously that of an old lady that conveys a wealth of emotion. Ikue’s songs can be emotionally effective, and they have touched many hearts across generations.